This rustic pie recipe is incredibly easy to make and uses fresh peaches for maximum flavour. 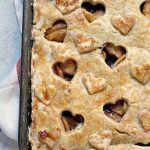 This Peach Slab Pie will be a hit with all your family and friends. Sugar for sprinkling on crust. Place 1st pie dough on lightly floured surface, top with 2nd pie dough, then 3rd pie dough. You will have 3 layers which you are going to roll out together so you have enough dough for the large pan. Roll out bottom crust so it's a bit bigger than your baking pan, that way it will come up the 1 inch sides to form a pie crust properly. Place in cookie sheet. Use your fingers to push into the corners and up the sides of the pan. Place peaches in a bowl after cutting. Drizzle with 1 tablespoon lemon juice. In another bowl mix both sugars, corn starch, 1 tablespoon lemon juice, cinnamon, nutmeg, and salt. Stir well. Toss peaches on bottom crust, then sprinkle sugar mixture over top. Roll out top crust using the other 3 pie doughs. Place 1st pie dough on lightly floured surface, top with 2nd pie dough, then 3rd pie dough. You will have 3 layers which you are going to roll out together so you have enough dough for the large pan. Roll out top crust so it's a bit bigger than your baking pan, that way you can pinch the edges. Place on top of the pie. Use your fingers to push into the corners and crimp the edges any way you like. Place in preheated oven and bake for about 40 to 55 minutes, depending on how dark you like your crust. Remove from the oven, and allow the pie to cool. Slice into squares once cooled. Serve the pie on it's own. Or serve with ice cream. You can also serve with shipped cream if you like. Or use both. Serve with a big old peach loving smile. You can double the fruit filling if you like a lot of fruit in your pie.